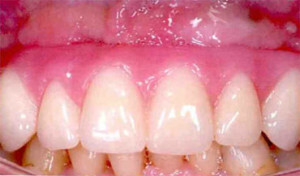 Stamford Periodontics and Implant Dentistry Center offers edentulous patients an efficient and effective restoration using only four implants to support an immediately loaded full-arch prosthesis. All-on-4 can be planned and performed using the NobelGuide treatment concept, ensuring accurate diagnostics, planning and implant placement. The NobelGuide Software allows for detailed diagnostics such as identification of available bone, virtual implant placement according to the anatomical situation and prosthetic needs, and ordering of an individualized surgical template. NobelGuide supports minimally invasive flapless techniques as well as surgical access through mini-flaps and full flaps, while the surgical template ensures guided and therefore exact implant placement. With All-on-4, patients benefit from an immediate implant-supported restoration, as a provisional prosthesis is screwed onto the implants right after surgery. 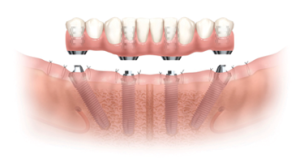 Final solutions for All-on-4 include both fixed prostheses, such as NobelProcera Implant Bridge Titanium with acrylic veneering, or individual NobelProcera crowns cemented to the bridge framework, and removable solutions, such as acrylic overdentures on a NobelProcera Implant Bar Overdenture.